Designed by multi-Major winner Ernie Els, The Els Club opened in April 2008 to critical acclaim not only for design but also playability. 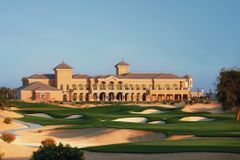 Located in the exclusive Dubai Sports City and measuring in excess of 7,500 yards from the Championship tees, it has been designed with Tournament play in mind. If that seems a little much for you, the forward tees measure a more manageable 6,200 yards which will provide a great test for any golfer. The course takes advantage of stunning desert scenery while using contours to create an almost links style course. Els has already experienced golf course design in his reworking of Wentworth’s West Course, and although his Dubai creation may be on another continent the same qualities of accuracy off the tee and a razor sharp short game are crucial to beating Old Man Par. For anyone wishing to improve their game while on their Dubai golf holiday, why not take advantage of the fantastic Butch Harmon School of Golf located on site. Butch Harmon’s talented assistants will be happy to help any golfer, drawing on the experiences of Harmon as one of the games most respected coaches. Very enjoyable to play but greens very fast so difficult to score well. We would definitely look to play again when in Dubai. My husband and sons really enjoyed playing this course and highly rated the practice facilities. Another superb course in cracking co edition, good test with lots of bunkers and the lions den was a tough few holes, overall excellent. We played the Els Club in January as part of our trip to Dubai and have to say it was one of the best courses we've ever played. The condition of the course was absolutely flawless, the greens, tees and fairways were all like carpet. The greens in particular were really impressive, I've never putted on anything as quick as them. 5 star service and hospitality with a nice terrace for watching the golfers come in. It is a bit tricky to find (we got lost in our hire car) but getting a cab from Dubai Marina or Jumeirah Lake Towers isn't much so probably best just doing that than driving. Would recommend the course and will be playing it again when we return.